I returned from the 2018 Food and Nutrition Conference and Expo™ refreshed, invigorated and recharged with a passion for nutrition and cancer. 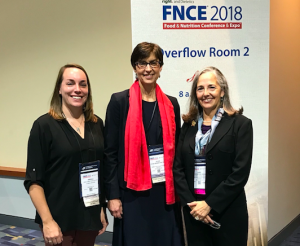 This year FNCE®, a conference for Registered Dietitians, was located D.C., right in AICR’s backyard. The conference included scientific sessions and a massive expo hall. I participated in “Ask the Dietitian” at the AICR exhibit. I answered questions and helped RDs navigate AICR information, but I ended the day inspired by all the creative work that dietitians are doing in their local communities. One dietitian told me about a pediatric oncology program that she is developing to help underserved children. I also heard from many RDs who are working to offer cooking and gardening programs to patients and survivors. And many wanted to stay up-to-date with the latest information on cancer prevention from AICR’s new Third Expert Report, and fancied our new brochures and publications they can use for patient education. Foods free of the top eight allergens; dairy-free milk made from a variety of products including a new banana-based milk; ice cream made with a hemp base and cacao added for flavor; tasty pumpkin seed butter and jam-like chia seed spread. Gluten-free products in almost every aisle. (I even tasted a bread product that is completely grain-free made from almond nut flour). Pre-and probiotic products including yogurts and kefirs, “added to,” and supplements. Many whole food products from commodity associations including walnuts, wild blueberries, strawberries, almonds, and grapes. There was a wealth of information to digest covering all aspects of nutrition, but here are the hot topics specific to nutrition and cancer that I specifically paid attention to as a specialist in oncology nutrition. Malnutrition is a risk factor for those diagnosed with pancreatic cancer. At the University of Oklahoma Health Science Center, a multidisciplinary team of healthcare professionals has created an evidence-based protocol to improve patients’ fitness prior to surgery that will help improve treatment tolerance (called pre-habilitation). The goal of this program is to improve the patients’ nutrition and functional status prior to surgery with the anticipation that this will help extend survival. Preliminary data is showing an improvement in the functional and nutritional status of the patients going through this program. Patients with cancer in the colon or small bowel can develop short gut syndrome due to bowel blockages and/or cancer resections. This session detailed specific methods for improving the absorption of vital nutrients and for reducing debilitating side effects from the short gut syndrome. Carol Parrish, RDN from the University of Virginia Health System, stated repeatedly that these patients are unique and need specific nutrition interventions to maximize their nutritional status. Two debates where hosted by leading researchers were heavily attended. The debate on intermittent fasting for those with obesity and/or type 2 diabetes was timely. My take away from this session is that intermittent fasting can have a role in weight management but it isn’t for everyone and certainly not for cancer patients who are at risk of malnutrition and cancer cachexia. The second debate provided a perspective on weight management and Health at Every Size (HAES). Can someone aspire to be healthy at any size? This debate fell in line with another talk on obesity and increased cancer risk in the presence of insulin resistance and inflammation. These sessions reinforced my practice ethic that my counseling should focus on achieving health goals regardless of body size. Emerging research on the microbiome was a hot topic. Discussions ranged from the beginning of life and how breast milk composition impacts the infant microbiome, the link between a healthy microbiome and reduced risk of diabetes and a discussion on the future role for probiotics in health.